Dr. Kathy Nguyen was born and raised in Houston. She graduated from University of Texas School of Dentistry in 2010 and has been practicing in the Houston area ever since. Every year, Dr. Nguyen continues to develop and learn the latest dental technologies by enrolling in numerous hours of advanced education seminars around the United States. She loves spending time with her family and two little dogs Henny and Remi. As a self-proclaimed foodie, she enjoys traveling, eating, and trying out new restaurants around the world. 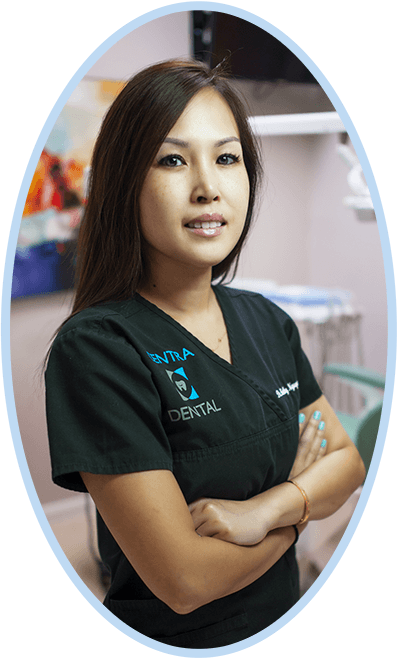 Dr. Kathy Nguyen and her dental staff want to provide the most comfortable and peaceful experience during your visit. They provide family friendly movies, games, and free wifi to keep all ages entertained. We are always striving each day to provide the best care for our patients. Our Houston-area dental office provides every type of dental procedure for every age group. We encourage all of our patients to maintain a healthy mouth as best they can and this includes undergoing a thorough teeth cleaning every six months. The reason we encourage this is because we want to keep every tooth cavity-free and so that patients do not have to undergo more serious dental treatments, such as dental crowns, root canals, or dental implants. This is why we also educate every patient on the best methods to keeping teeth clean and strong. We know that oral education can help ensure an entire family has healthy and beautiful smiles. We also focus on pediatric dentistry because teeth arrive so early in life and maintaining them in a pristine manner should start just as early. We love working with kids, which is why we have created a great atmosphere for all of your loved ones, especially the little ones.